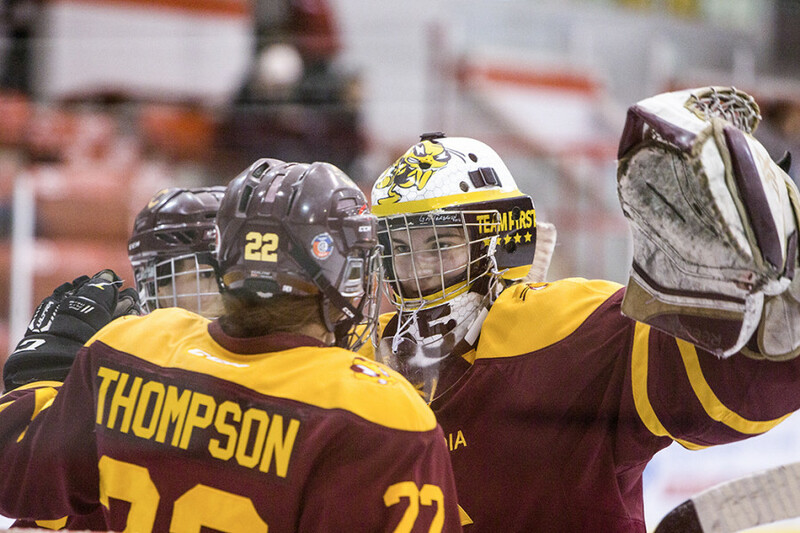 The Concordia Stingers lacked energy and flair against the strong McGill Martlets, who took game one of the Réseau du sport étudiant du Québec conference final by a score of 4-0 at McConnell Arena on Thursday night. “That hasn’t happened in while I think we need to get to a [mentality] where it’s do-or-die, and this game wasn’t that,” she said. The crosstown rivals have a rich playoff history. Prior to this season, Concordia won all five finals in 1999, 2000, 2001, 2002, 2005. However, McGill holds the edge in recent semi-final meetings, defeating the Stingers in 2007, 2008, 2009 and 2014. Both teams started the game slowly. The Stingers found themselves defending against the Martlets for most of the period. Rookie forward Marie-Pascale Bernier made two turnovers in the Stingers zone but McGill couldn’t capitalize. Concordia’s best chance came off an individual effort from forward Claudia Dubois, who fended off her opponents through the neutral zone. She lost her footing near a defending player inside the blueline but nonetheless fired a shot that was stopped by Martlets Tricia Deguire, who ended the night with 19 saves. While the Stingers struggled to maintain offensive pressure, the Martlets didn’t play their best period either. Head coach Peter Smith felt that his team got off to a slow start and lacked urgency in their play. “I hold high standards for myself. I’m hoping that I bring a better game on Saturday.” —Concordia Stingers goaltender Katherine Purchase. McGill took advantage of their chances when Stingers defender Caroll-Ann Gagne fell at the Martlets blue line. 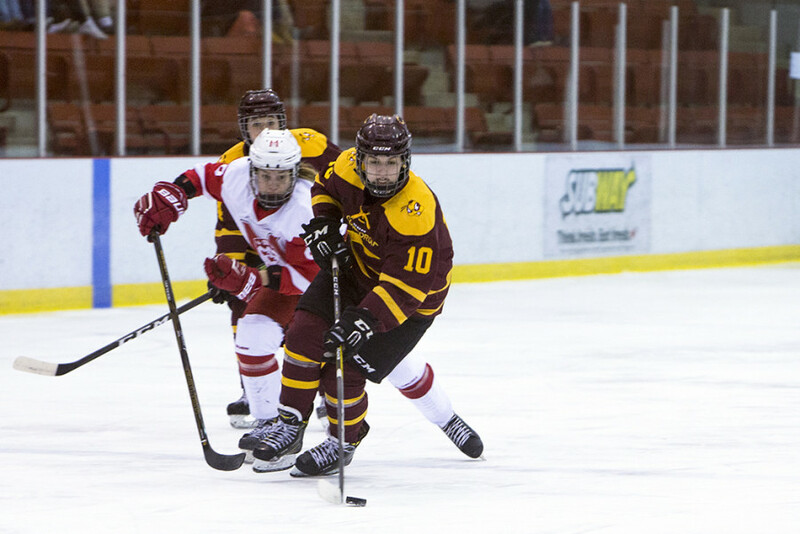 Forwards Lea Dumais and Shana Walker broke out on a two-on-one, which allowed McGill to set up in Concordia’s zone. Forward Olivia Atkinson swept in near the left the face off circle and beat Katherine Purchase between the legs at 12:55 of the first period. McGill carried the momentum into the second period while the Stingers continued to struggle. Despite a few good opportunities against the Martlets, like a two-on-one chance featuring Alexandra D’Onofrio and Keriann Schofield, the Stingers were unable to find the back of the net. Instead, the red and white took over. Forward Cora Constantinou chipped the puck over to teammate Gabrielle Davidson, who out-skated Concordia’s defense and beat Purchase top-shelf to double her team’s lead. With 0.3 seconds left on the clock, McGill struck again. Atkinson added her second goal of the night in a wide-open net. Purchase came out to challenge Davidson but left a gaping hole for Atkinson to triple her team’s tally. Late goals always hurt a team’s morale but Chu made it clear during the second period intermission that she wanted to see her team fight back. The head coach juggled with her lines in the third period, which helped the team regain some energy. Concordia had 10 shots on goal, which is one more shot than what they were able to generate throughout the first 40 minutes. However, it wasn’t enough to overcome a three-goal deficit, let alone close a four-goal gap when Daoust scored at 12:59 of the period. Purchase was visibly discontent with her performance. While the Martlets dominated the last two periods to take game one, Smith wanted to see his team play with more desperation. “I thought at times we had good urgency in the game tonight, maybe not quite a complete game, but certainly a solid effort by our group,” he said. “Concordia, you know, they’re gonna have their backs to the wall and they’re gonna play with desperation and we need to match that,” he said. The Stingers will host the Martlets at Ed Meagher arena on Saturday at 2 p.m and will try to force game three for an ultimate showdown.